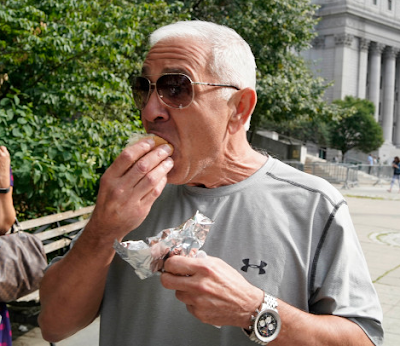 A day after convincing a judge that the food in jail was so bad for him that he needed to be let out on bail, mobster John “Porky” Zancocchio stuck it to the feds by scarfing down a food-cart hot dog. “Keep the change” the 60-year-old told the vendor as he handed him a $20 bill for his $2 hot dog. Zancocchio has served as both a capo and consigliere in the Bonanno family. He will face trial next year on loansharking and bookmaking charges. Yesterday Zancocchio convinced a judge — over strong objections of prosecutors — that he should be let back out until his trial because the food in jail is killing him. “The dietary regimen at the MCC, which consists nearly entirely of sugar and carbohydrates, dangerously exasperates his condition” his lawyer claimed. 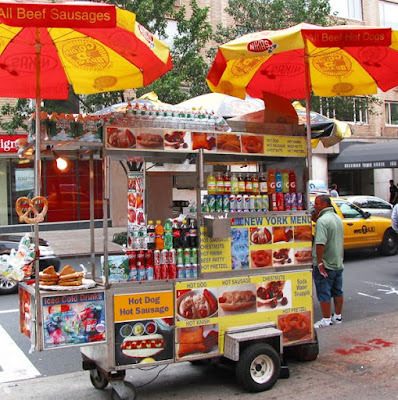 The 280-calorie dog — which has roughly 17.5 grams of fat, 850 mg of sodium, 45 mg of cholesterol and 24 grams of carbs without counting the sauerkraut was described as "Excellent" by the wise guy.